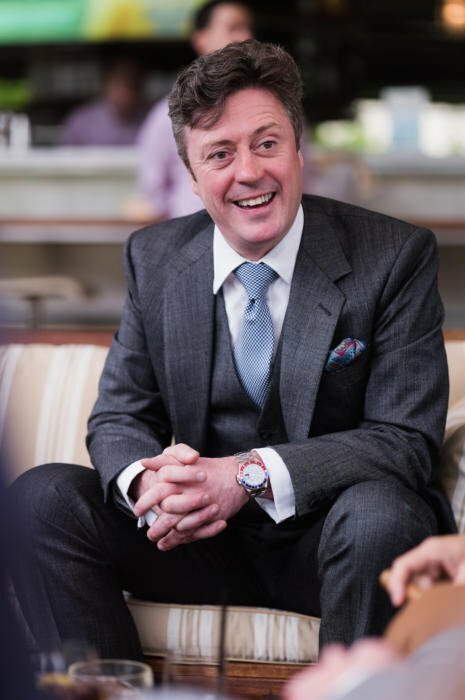 Before the public part of Tailoring Symposium in June, we all gathered next to the pool at the Four Seasons to have a chat about tailoring and its future, with The Rake busily making a video of the event in the background. This was perhaps the most pleasant part of the day, with myself and Wei posing questions to these greats of bespoke tailoring – gathered together for the first time. As expected, everyone had similar stories to tell, about difficult customers, about the benefits and dangers of having a house style, and about new blood coming into the craft. Our two Italians, Antonio Liverano and Antonio Panico, didn’t speak enough English to interact directly with, say, John Hitchcock of Anderson & Sheppard, but with the kind aid of Tommaso Melani of Stefano Bemer, it became clear that the three of them were saying exactly the same thing about the rigidity of house styles. Just with different mannerisms and anecdotes. As I say, it’s what you’d expect – similar experiences, similar headaches – yet it was a pleasant surprise to see it play out before our eyes. I’m sure we’ll organise something similar next year. Here’s hoping it is equally as productive and as enjoyable. 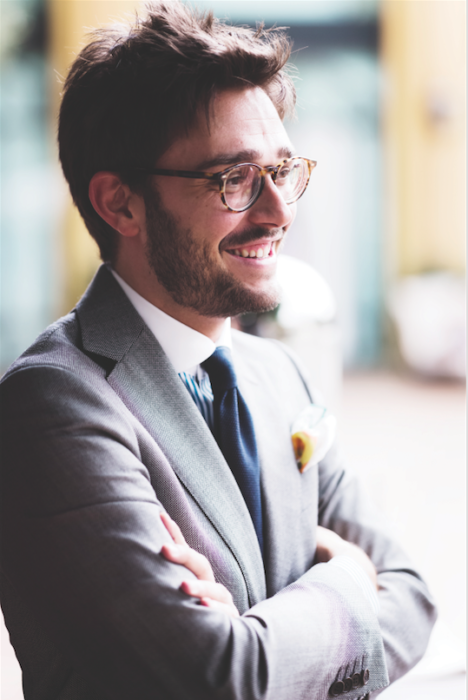 The event was kindly supported by Stefano Bemer and Vitale Barberis Canonico, with The Rake as official magazine. Check out Tom’s great article on the event in the current issue of The Rake. Posts on the public part of the Symposium here, and analysis of the styles of the different tailors here. You can follow the discussion on House styles and difficult customers: The Tailoring Symposium by entering your email address in the box below. You will then receive an email every time a new comment is added. These will also contain a link to a page where you can stop the alerts, and remove all of your related data from the site. It’s funny that they mention difficult customers but make no mention of difficult tailors. It’s very rare, in my limited experience, that a tailor will admit a mistake much less correct it to the satisfaction of the customer. What are your thoughts on this? I believe this is something that needs to be addressed. Surely one can expect a perfect fitting garment if they’re paying a very large premium over rtw. I’ve certainly known tailors that won’t admit to their mistakes, though the best ones will usually take criticism in a fairly open way. At the least, not admitting errors is a sure way to lose a customer, and creating long-term customers is the only way bespoke works as a business. Interesting on the expectations point. I certainly think you should expect a very high level of quality, but what you should really expect from that is all the hours of handwork that raise bespoke far above RTW. That’s why you pay more. RTW is a perfected, low-level process and will always be more consistent. With bespoke, more important than the price is the margin the tailor is making – which is pretty much always lower than RTW. I think there are probably two main types of “mistakes”. The first is when the “spec” comes out wrong, eg got a ticket pocket which wasn’t asked for. This type of mistake is normally black and white. The second is more around fit related issues. Much harder to resolve; more flare, less skirt, shorter sleeve, more snap, etc. So much of this can be avoided through clear discussion during the various fittings. How many customers wait until the garment is finished before commenting about the fit? That’s the problem, Anon. You expect perfection when it doesn’t exist. You’re perfectly entitled to expect a very good level of fit and quality. Far better than RTW. I’d guess they’re referring to people such as yourself. Be more reasonable or else go and do it better yourself if you know more than the likes of Edward Sexton and the rest. Tailoring sounds easy to you. It’s anything but easy. I think that’s a bit too aggressive, it was a reasonable question. Can we keep it calm and not become a forum please? Apologies to all. It does sound rather aggressive doesn’t it?. Perhaps Anon hasn’t found the right tailor yet. I simply meant that those expecting ‘perfection’ do not understand the process. Please have a little respect for those that do. Thanks for posting this. Great tailors in beautiful ensembles. Edward Sexton (what excellent style and taste he displays!) and Tomassa Melani are particular favourites and the choice of John Hitchcock’s tie to match his suit is sublime. Following your piece on the subject Sexton’s boutonniere now stands out…did you have any favourites from the day? Yes, Edward’s flower is exactly the right size isn’t it? So what are the benefits and dangers of having a house style? Good point, should have mentioned that in the post. Broadly, the benefits are that it enables you to refine a particular look, or construction technique, and both perfect it and do it more efficiently. It also helps with marketing, enabling you to stand out. The dangers are that you lose customers that don’t want that look. And you’ll constantly face the challenge of people that want ‘Anderson & Sheppard, but just a bit less drape, and a narrower sleeve, and a stronger shoulder…’ until it’s no longer your style at all. Of course, the dangers of not having a house style, and trying to be everything to everyone, are also that you stray too often out of your comfort zone. English tailors trying to do a Neapolitan cut/make being the most obvious example. Thanks for the answer. Are there tailors that don’t have house styles? Wouldn’t all tailors have some style and system they default to? I often find myself explaining to people that most tailors don’t or can’t stray very far from what the style they were trained in. Many people have the idea that a bespoke tailor can make the customer anything they want, and that’s certainly not the case. As you suggest, one can’t expect to get a Neapolitan style from an English tailor. I wonder, if someone asked Richard Anderson for some drape, could he do it? He’d probably tell the customer to go to Anderson & Sheppard. Simon, Tommaso’s jacket is fabulous! What a marvelous Summer coat! Do you know who made it? It’s absolutely key people are firm and clear with the tailors during a fitting. To not do so is almost unfair on the tailor when things don’t turn out to plan. Somethings they should undoubtedly get right without interference, collar area etc being the most obvious. But other things are a lot more open to interpretation and how you want it to fit in the end – I once took a friend to a tailor who later complained months after the suit was ready it was a little bit too loose and boxy for his taste. “Why didn’t you mention it during the fittings, or even on pick up?” I asked. It’s really not fair to blame the tailor in such an instance. And, unrelated to that, but relating to the comments above, I have to be honest, I can honestly say I have never worked with a ‘difficult’ tailor…. I have heard horror stories of iGents being obnoxious and demanding though. My first comment was to not to paint all tailors as being incompetent. Rather, when an issue arises through the tailor’s error, they don’t want to hold up their hands. As for myself, I’ve recently had to bin a pair of trousers due my not communicating my requirements more clearly. I did not raise this with the tailor as it was my fault. I’ve had good experiences and bad. I simply wanted so show that there are two sides to the relationship. If there are any tailors here, please accept my apologies if any offence has been caused. I think part of the problem here is we have too many ‘Anonymous(es)’? Giving the tailor a pretty free hand – at least at first – is the way to go. I notice you pretty much do this. A very good idea is that to envisage a follow up to this event next year. PS: please, Simon, could you plan a post on ties and their sliding scale of formality, something similar to what you did on shoes? Thank you, Simon! It would be really helpful to many PS’ readers as you guess. I would dearly love this on shirts as well! I’ve had some very good experiences with bespoke but also some really disappointing ones, which are probably magnified by both the cost and expectations. I find this can be the case in any field of work where you are essentially ‘the boss’ to someone who is very skilled and experienced – you want to defer to their experience but if you let them do everything solely on their terms, you can end up with really annoying aspects of the end product which are generally too far down the line to change (I work in television, even the best editors and cameramen can veer off at times). It’s obviously all about building a relationship where both parties know what they want and when to step in, but with bespoke that can be a very expensive road to travel. I have fairly standard proportions and have recently found a good MTM tailor and been much more consistently happy with the results. The build quality is obviously somewhat less but fabric and fit are most important to me and I find I can select really high quality fabrics, still have significant control over the fit, at much less than half the price. Dear Simon, I recently discovered your excellent blog. Thank you for a number of helpfull and knowledgeable posts. On the issue of house styles I have wondered whether some house styles look better on some body types? If you are slim and tall, are there some tailors that work better than if you are short and stocky? If so I think that would be an excellent topic for a post. I am currently considering making my first bespoke order and this is one issue I have been wondering about. As one poster noted above, when dining at an excellent steak house, dont order the Fish, and as such, for my first bespoke suit I would prefer to go for the house style of my chosen tailor. +1 on this. It’s easy to find out what the house style of a tailor is – less so who that style will work for. Simon, by observing your outfit and your way of wearing it including accessories ( in this case by exposing the back blade of y our tie and by having the shirt collar left half folded up) I realize that You are becoming more neapolitan , as far dressing, than a true neapolitan gentleman. 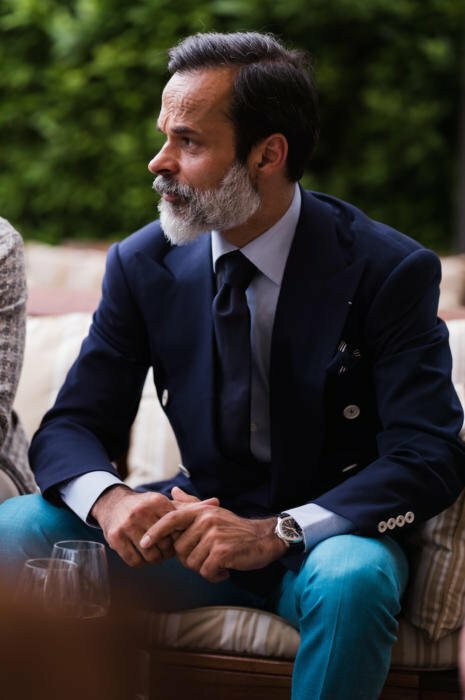 In any case it is evident that nothing as the neapolitan tailoring style provides “per se ” a certain degree of sprezzatura and nonchalance , independently from taste and willing of wearers. The collar is interesting. I didn’t realise it was doing that until I saw the pictures, and it was because I forgot to put the collar bones back in. Which, of course, is how that silly fashion started. A lightly top-fused collar will sometimes stick out around a lapel if that lapel is sufficiently open, and if the collar doesn’t have collarbones to support it. Either pure nonchalance, or sheer laziness. Following on from previous comments I have also noted your shift in taste from Saville Row to Naepolitian tailoring having read a lot of your articles from years gone by. Secondly there is a distinct lack of anything from yourself regarding tailoring in the UK beyond London. Would be good to hear your views of tailors “north of Watford” and see you commision work from them . Thanks. It’s interesting, I don’t think I wear anything more from Italy than from England, but it’s certainly 50:50. It’s also seasonal – I’m much more likely to wear lightweight Neapolitan stuff in the summer, where the winter is mostly by A&S DBs and Sexton/Chittleborough. The point about climate is an important one. By focusing purely on stylistic details we sometimes forget that they normally evolved for practical reasons. After all the Neapolitan style came about because tailors there were trying to reimagine Savile Row-style suits to make them easier to wear in the much hotter climate of Southern Italy. 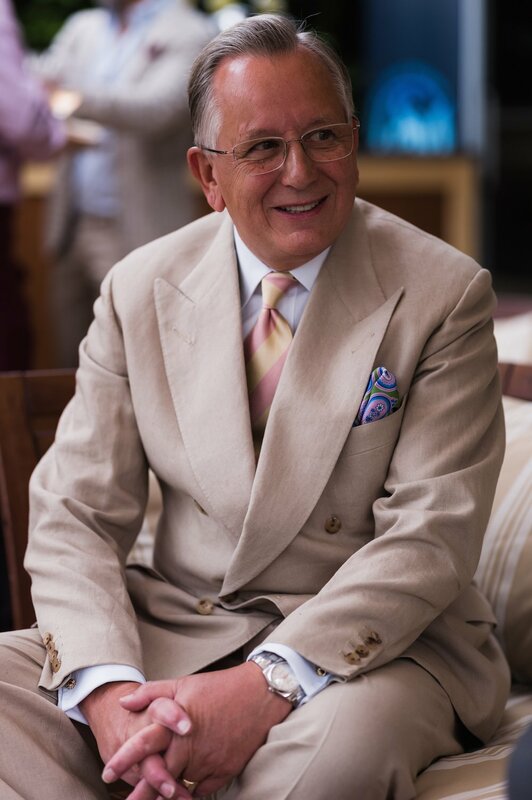 As someone who has both British and Neapolitan suits, once I moved to Hong Kong the latter were simply much better-suited to the climate, and so I now wear them much more, and tend to commission from Italian tailors for the most part. I must say, Edward Sexton’s outfit really is exceptional. 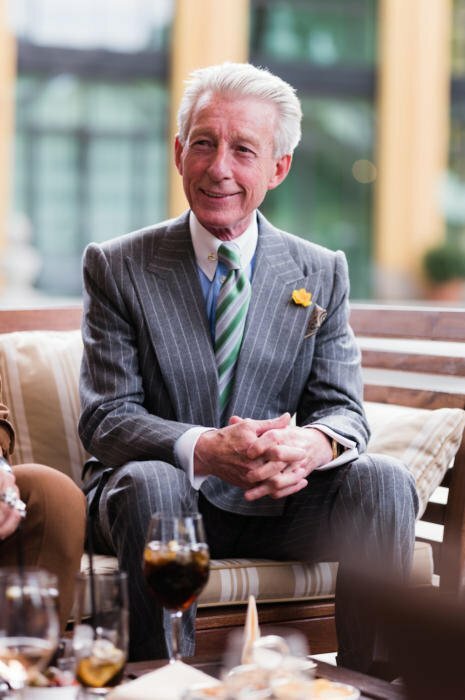 So many bold elements; pinstripes, boutonniere, bright green tie, those shoulders and lapels… and yet he manages to bring them all together so harmoniously that no one thing looks out of place. That is true style. On a different topic, where do you stand these days on your “logical waistcoat” theory? It’s a very appealing idea (for all the reasons outlined in your original post) but I worry it looks a bit odd to wear a three piece suit without the jacket. Perhaps a bit too much like a waiter…? I still use it pretty much every week. Quality of the clothing avoids it looking too much like a waiter, as does adding casual elements – eg yesterday I wore my Cifonelli navy waistcoat and trousers, with black suede shoes and a grey cashmere tie. I don’t think a waiter would be wearing either of the latter two. Nice. Funnily enough, yesterday I wore my Cifonelli navy waistcoat and trousers, with burgundy shoes and a black and white shepherd’s check tie, so is good to know it gets the PS approval! To hell with comfort! I don’t subscribe to the paper-thin cloths with collapsing shoulders and crumpled chests model of ‘tailoring’. Unless you’re digging the garden. A great deal of Savile Row’s business is summer clothing. It is possible to be both cool and formal. That’s the English style for you. Does a Guardsman in his heavy red tunic and big bear fur hat complain he’s a touch hot at Trooping The Colour in June? Maybe he’d be more comfortable in shorts and flip flops? Formality must come first. Before comfort (whatever your nationality). Neapolitan white tie will never cut the mustard. If comfort is a priority I can recommend Abercrombie & Fitch. It’s within easy distance of Savile Row. Quick you might still make the Sale! To be fair, England in June is not really the same as Hong Kong in August, nor are Rubinacci or Panico quite comparable to Abercrombie & Fitch. Some might say that wearing tailored clothing in the tropics is more of a statement of belief in formality than wearing a Savile Row suit in the cool weather of the English summer (when flip flops would leave the feet distinctly cold)! Quite an extreme view Mac, although I do admire your commitment! Personally I rather like exploring ways to balance a love of craftsmanship and tailored clothing with other considerations like comfort, temperature and modern life in general (casual offices, fewer formal events, etc.) Most people would look pretty silly showing up to a casual dinner wearing a double breasted suit and tie (although more power to you if you can rock the look!) 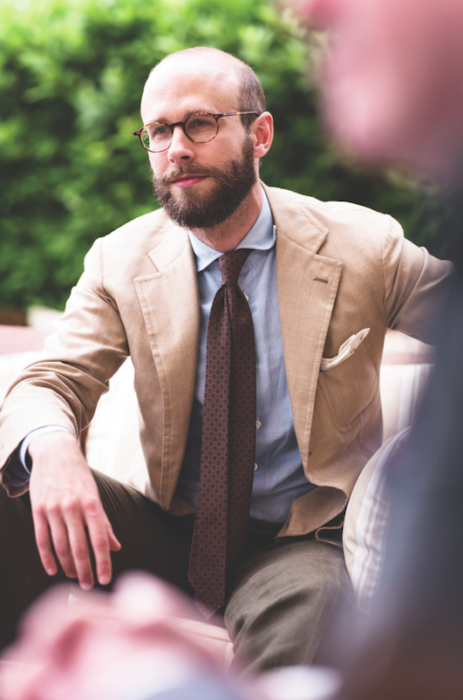 but a light, softly tailored Neapolitan jacket can look very smart without being overly formal. Can you take a guess at the fabric of Cifonelli’s navy jacket? I love its texture and have a few linen pieces that resemble it, but I’m wondering if the same effect is achievable in cotton and wool. Super 110s wool gabardine, royal blue. I’m very fascinated by Anderson & Sheppard and Panico points of contact. Simon,in your opinion (theoretically) what could learn Anderson & Sheppard from Panico and Panico from Anderson & Sheppard? What fabric is Mr. Hitchcock wearing, here? Looks like some kind of wool/silk/linen blend. I noticed that lapels vary from house to house; the lapels on the Anderson and Sheppard SB jackets are more convex while the lapels on Liverano SB jackets are more concave. Is this purely for aesthetics reasons or do they serve a purpose? If so what are the benefits of each lapel shape? I may be confusing myself, but you’re right. I’ll use the pictures from the Tailoring Symposium post from June 19, 2015 as a reference: the SB Jackets from Anderson & Sheppard & Edward Sexton have more belly compared to the SB Jackets that Liverano show (specifically the ones worn by Alan & Taka). I’m looking forward to reading about a longer post explaining the pros and cons of lapel shapes on different body types, as well as pros and cons of open/rounder quarters vs closed quarters on different body types. I’m personally interested because I’m having trouble finding what proportions/combinations would flatter me the most. I’m short (5’5″) and have broad chest/shoulders (40″ chest, 31″ waist). Will straighter lapels and open quarters balance the top heavy part of my body or will it do me a disservice and make me look shorter? I would be really grateful for some advice. While not related to this post, I was not sure where to post it as you don’t appear to have had this problem yourself. I am having a bespoke dinner suit made. When I ordered the suit, I specified a single breasted peak lapel coat. All the fittings have been fine. However, today I went to collect the final suit and to my horror, it had a notched lapel. I immediately pointed this out to the tailor, who seemed shocked. Initially, he said it would be very difficult to change. He suggested that I try the suit on. He obviously went to check his order book, because I noticed this was out on his workbench when I left. He then came back and said that it could be sorted. He suggested that he trim the facing under the notch and replace the collar to make lapel peaked. I did ask whether we could just replace the who facing to make a peak lapel, and offered to pay extra for this (even though the fault was his, I would rather get it right, instead of having a suit I don’t want). He told me that this was not needed and it could be sorted by his suggestion. He did chalk it up on facing and I understand what he is saying, but I just wonder if the lapel is going to be a bit low and look odd. What do people think? Some may say that I should insist on a new suit. However, the reality is that I can’t force this and I have already paid for the majority of the suit. P.S. I have used this tailor in the past and have been very happy. You certainly have grounds to get it replaced. I can see how his suggestion could work, but the peak would certainly be a lot lower than normal, and probably thinner. Think hard about whether that matters to you or not. Worse to pay for a suit you never wear. Since the event took place in Florence, should’nt it say: most didn’t speak enough Italian to directly interact with Liverano and Pacino? Would be kind of polite being hosted in Italy, wouldn’t it? I’m enjoying the discussion, particularly around house style. I’ve struggled to identify the differing house styles, and have, as a result, stopped buying bespoke. I was a loyal customer of one of the two big names on Savile Row for a decade or so, but was dissatisfied to various degrees with all but the first suit purchased. The point made on neck cut was what prompted this post. I have a slightly falling left shoulder and a slight stoop, which perhaps makes the neck cut more of a challenge, but nevertheless I expected such an elemental part of the fit to be beyond reproach. Sadly, it was not the case. I wonder whether the lapses I encountered were to do with my original cutter having moved on, to be replaced by a rather less experienced cutter. For what it’s worth, a well presented summary of different house styles would likely tempt me back to Savile Row, and I commend your efforts to supply the same. If someone likes the bespoke house style, is that not the same as sort of stock pattern making, i.e. The style is already there and all the tailor does is make it in your size? No Joel, they are fundamentally different. One is about style, the other is about fit.